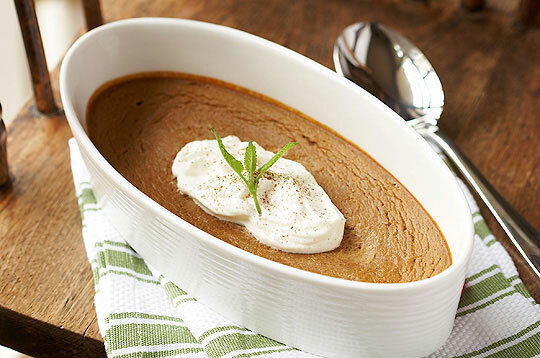 Tastes like pumpkin pie made tastier with apples and easier without a crust. 1. Preheat oven to 400°F (200°C). Spray medium-sized casserole dish or 6 individual ramekins with cooking oil spray. 2. In large mixing bowl, beat eggs until smooth. Add all remaining ingredients except apples and beat until well blended. 3. Place diced apples into baking dish or divide evenly amongst ramekins. 4. Pour pumpkin mixture over apples. 5. Put in the oven and bake for 15 minutes. Reduce heat to 325°F and continue baking for an additional 35 minutes or until knife inserted in the centre comes out moist but clean. Serve warm or cold garnished with a little whipped cream.